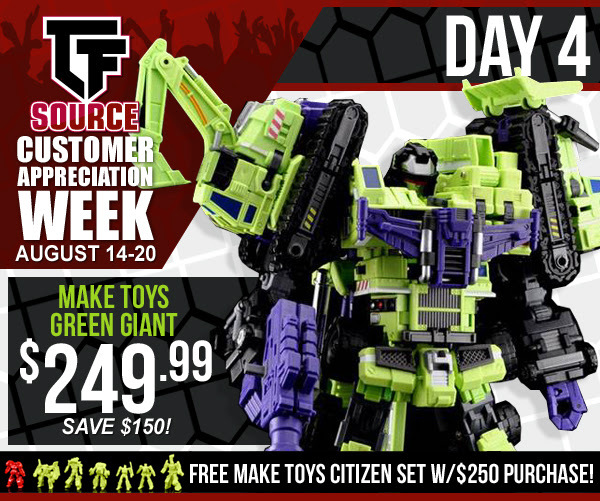 TFSource Customer Appreciation Week – Day 4! Make Toys Green Giant $249.99! You SAVE $150! $20 TFSource Store Credit Giveaway! TFSource Store Credit Giveaway5 winners have a chance at winning $20 Store Credit! selected and DM’d. Must follow TFSource on Twitter. Giveaway ends Friday 8/18 at 7am pst.